Olly's adventures into the world of flavour. Olly spends his life creating recipes or finding foods to match the wild cauldron of flavours that are bursting to get out of his bulging drinks cabinet. Food is good, but good food matched with good wine is even better. Olly knows how the combination of good food and drink helps harness memories of times past, and his recollections of many happy hours spent in the kitchen and at the table bring his book to life. 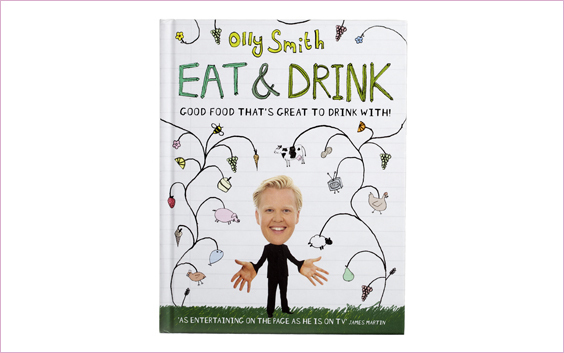 Olly will show you how to achieve taste heaven by partnering the right food and drink. Divided into chapters by flavour - citrus, spicy, sweet, creamy, smoky - EAT & DRINK explores the food and drink that can be combined to create unforgettable flavour moments to savour and treasure. Olly accompanies his recommendations with a collection of his own favourite recipes. Written in the distinctive, fun style that has made him such a hit on our screens, it will be impossible not to be caught up by Olly's enthusiasm for eating and drinking. All personalised messages are handwritten by Olly.